Authorities Thursday identified the Chula Vista woman who was fatally injured this week when her SUV collided with a Border Patrol SUV in Chula Vista’s Eastlake Trails neighborhood. Maria C. Webb, 44, died early Tuesday at Scripps Mercy Hospital in San Diego about an hour after the crash, which happened at 12:34 a.m. at the rain-soaked intersection of Otay Lakes Road and Hunte Parkway, according to police and the San Diego County Medical Examiner’s Office. Webb died from multiple blunt force injuries. 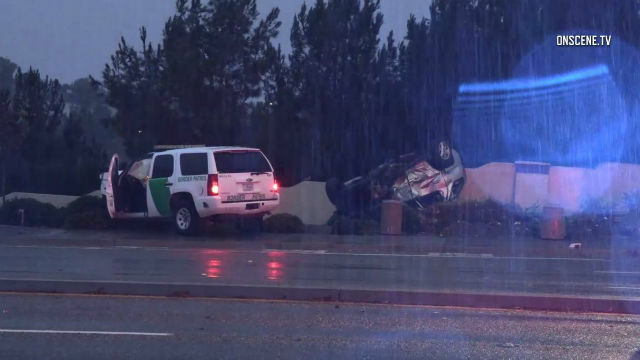 The Border Patrol officer, whose identity was not released, was on duty and driving an agency vehicle when he suffered minor, non-life-threatening injuries in the crash, Chula Vista police Lt. Miriam Foxx said. Authorities have not said what caused the SUVs to collide, including whether Webb or the Border Patrol agent ran a red light. Webb was driving a Pontiac Aztek southbound on Hunte Parkway when her SUV was broadsided by the Border Patrol SUV, which was eastbound on Otay Lakes Road, the medical examiner’s office said. Webb’s Aztek overturned at least once. When paramedics arrived, the 44-year-old had no pulse and she was rushed to Scripps Mercy Hospital as paramedics tried to save her life, the medical examiner’s office said. The aggressive life-saving efforts continued at the hospital, but doctors pronounced her dead at 1:42 a.m.
Any potential witnesses or anyone with information about the deadly collision was asked to call the Chula Vista Police Department at (619) 691- 5151.